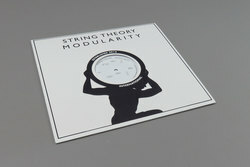 string theory - Modularity. Vinyl EP. Bleep. Rhythm Section with another funky, jazzy house record here. This time it’s the turn of Glaswegian duo String Theory to strut their stuff for Bradley Zero’s label. Despite being the group’s debut release, Modularity is a record with a very well-realised aesthetic. Be they working with shuffles, breaks or four-on-the-floors, the pair always end up with a groovy, woozy house jam. A-sides ‘Dirty High’ and ‘Mr. Tiger’ front like Theo Parrish’s ‘Flowers’ as reimagined by Weather Report, and the production also features an impressive attention to detail. Things are more energetic on the B-side. Those who’ve enjoyed the RS drops by Henry Wu and Mallard will be able to get behind this.